Securities America and its other IBDs post sales of $188 million, announce hiring of additional recruiter. 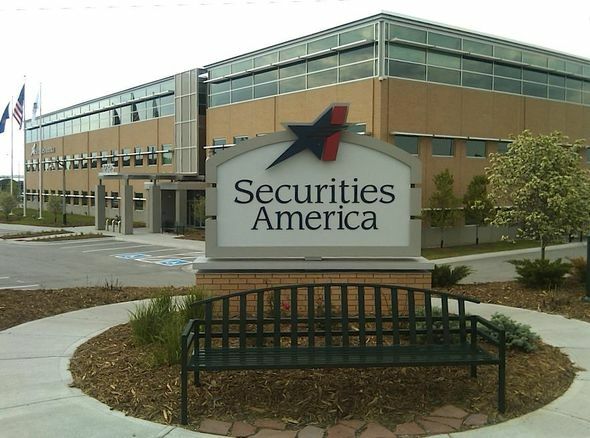 Securities America headquarters in La Vista, Neb. Ladenburg Thalmann Financial Services (LTS), the parent company of Securities America, said early Thursday that its net income soared to $1.1 million, or $0.01 per share, in the first quarter vs. $100,000, or $0.00 per share, in the year-ago period — meeting estimates. First-quarter revenues were $211.8 million, a 13% increase from revenues of $187.3 million in the first quarter of 2013. These results beat analysts’ estimates of $204 million. “Ladenburg performed very well in the first quarter, as strong growth in advisory and commission revenues and in investment banking fees fueled a 13% increase in total revenues and a meaningful increase in adjusted [earnings before interest, taxes, depreciation and amortization] compared to the year-ago period,” said Dr. Phillip Frost, chairman of Ladenburg, in a press release. “With approximately $90 billion in client assets firmwide, our independent brokerage franchise continues to excel and our investment banking business is hitting its stride amidst stronger capital markets,” Frost added. It stock was trading up 2% to nearly trade at close to $2.80 on Thursday. The Independent Brokerage and Advisory Services unit, which includes independent broker-dealers Securities America, Triad and Investacorp, had sales of $211.8 million, up from $187.2 million a year ago. The unit’s net income grew to $4.3 million from $136,000. Recurring revenues, which consist of advisory fees, trailing commissions, cash sweep fees and certain other fees, represented about 69% of revenues for the unit vs. roughly 65% in the prior quarter and about 64% in the year-ago period. “Ladenburg’s independent broker-dealer business benefited from strong recruiting activity in the first quarter. Growth in commissions, advisory fees and investment banking activity helped drive performance across the firm,” explained President & CEO Richard Lampen, in a statement. On Wednesday, Securities America, which has more than 1,700 affilated advisors and $50 billion in client assets, said it hired Joel Triemstra to become a regional director of branch office development. The IBD says Triemstra will help the recruiting team manage “the increasing pipeline of prospective advisors considering joining” it. Triemstra, 53, joins Securities America with more than 20 years of experience in the financial services industry. He will be supporting the area of the country stretching from the Western Great Lakes region south through Alabama. Prior to joining Securities America, Triemstra served in recruiting roles at Sammons Securities, brokersXpress LLC and LPL Financial (LPLA). Last month, the IBD reported that Fortress Wealth Advisors of Omaha, Neb., had become an affilate. Financial advisors Dana Webb and Curren Webb, another father-son team, opened Fortress Wealth Advisors in mid-January and have transitioned nearly $100 million in client assets to Securities America. They were previously with Manarin Investment Counsel of Omaha. Check out ThinkAdvisor’s Q1 Earnings Calendar for the Finance Sector.